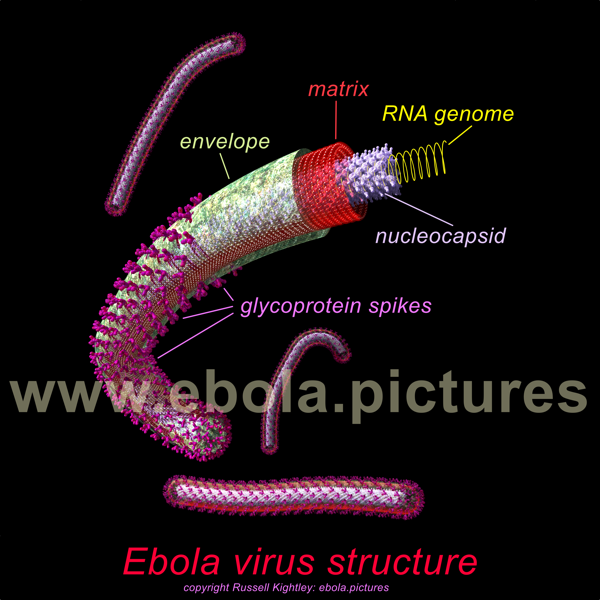 Annotated diagram of Ebola Virus Structure. Virus particle cutaway to reveal underlying structures. Above image measures 600 pixels across, original image is 8000 pixels across. See all Ebola pictures. 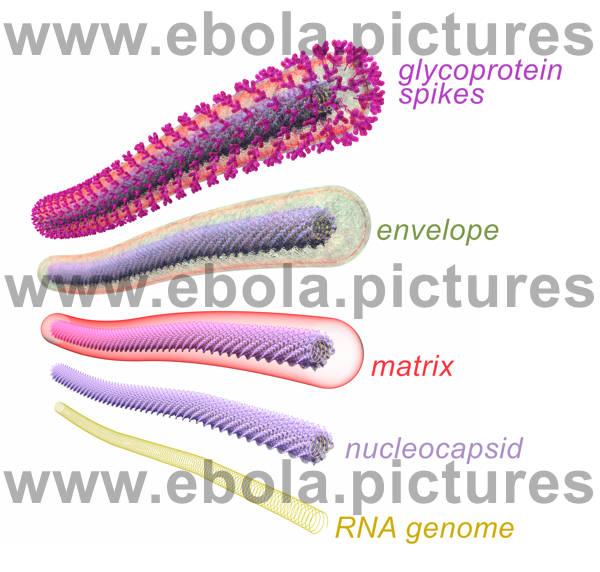 Labelled graphic of Ebola Virus showing glycoprotein spikes, viral envelope, matrix, nucleocapsid, and genomic RNA. Above image measures 600 pixels across, original image is 8000 pixels across. Graphic shows Ebola Virus life Cycle. Above image measures 400 pixels across, original image is 3300 pixels across. 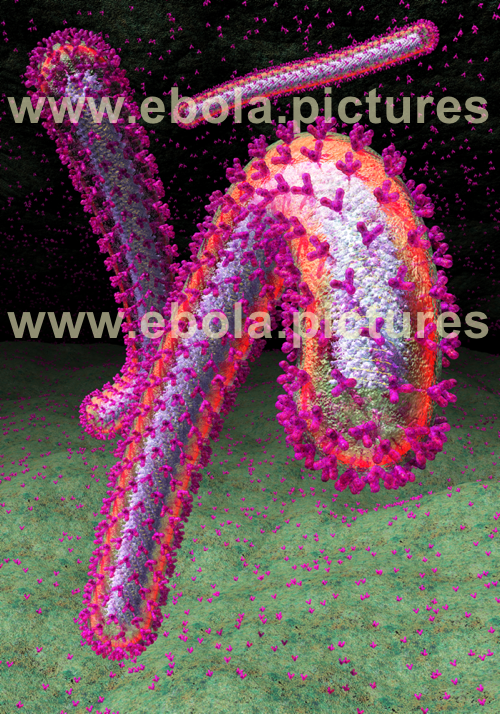 (above) Ebola virus docks with cell membrane at middle left. Viral RNA (yellow) is released into the cytoplasm where it directs the production of new viral proteins and genetic material. New viral genomes are rapidly coated in protein to create cores. 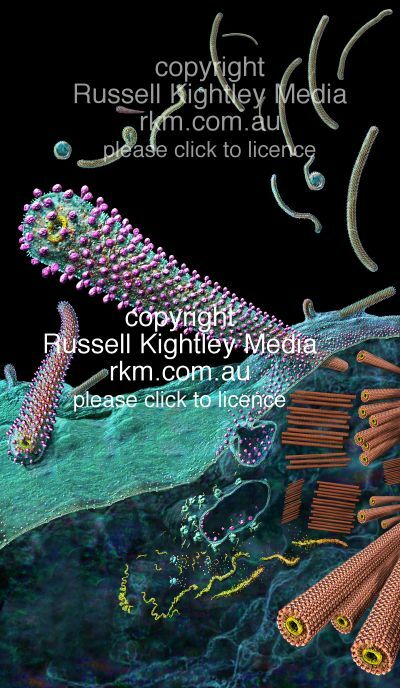 These viral cores stack up in the cell and migrate to the cell surface. Transmembrane proteins (purple) are produced which are ferried to the cell surface. Cores push their way through the cell membrane becoming enveloped in cell membrane and collecting their transmembrane proteins (spikes) as they do so. Examples of coiled virions are shown in the background. Personal References: With many thanks to Dr Frederick A. Murphy, UC Davis, for all his helpful comments and suggestions. I would also like to thank Prof. Frank Fenner and Prof. Gordon Ada of the John Curtin School of Medical Research at the Australian National University for their initial help and for referring me to relevant sources. D.S. Ellis, Susan Stamford, D.G. Tovey, G. Lloyd, E.T.W. Bowen, G.S. Platt, Hilary Way and D.I.H. Simpson: "Ebola and Marburg Viruses: I Some Ultrastructural Differences Between Strains When Grown in Vero Cells" Journal of Medical Virology 4:201-211 (1979). D.S. Ellis, Susan Stamford, D.G. Tovey, G. Lloyd, E.T.W. Bowen, G.S. Platt, Hilary Way and D.I.H. Simpson: "Ebola and Marburg Viruses: II Their Development Within Vero Cells and the Extra-Cellular Formation of Branched and Torus Forms" Journal of Medical Virology 4:213-225 (1979). 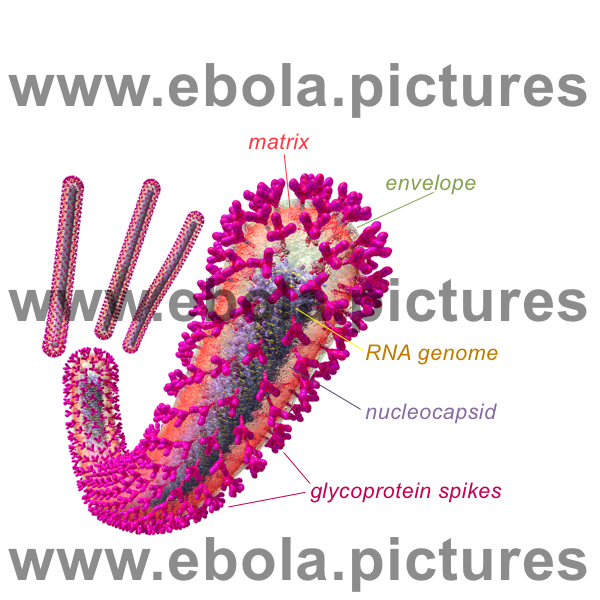 Ebola Virus Structure: progressive dissection of an Ebola virus particles. Above image measures 600 pixels across, original image is 5879 x 5609 pixels. See all Ebola pictures. From Ed Rybicki at the University of Cape Town, South Africa: Occurances of Ebola and virus entry into animal cells. Ed Rybicki also curates a Virus News Site which is a brilliant source of information. You can get alerts from this site.